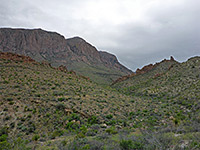 Five trails start in close proximity along Ross Maxwell Scenic Drive, west of the Chisos Mountains in Big Bend National Park, visiting varied locations including red rock pinnacles (Blue Creek Canyon), a narrow canyon and dryfall (Upper Burro Mesa Pouroff), ruins and colorful rocks (Apache Canyon) and a secret, secluded waterfall (Cattail Falls). The other path, perhaps the least interesting, is the 1.6 mile route to Ward Spring, a small but permanent water source along the upper section of the shallow valley of Cottonwood Creek, which at this point is moderately enclosed and quite overgrown. Most of the hike is across open, shadeless ground, allowing long distance views, of the mountains, the lesser peaks to the west, and the gently undulating terrain either side of the drainage. This area is home to abundant plant life including over a dozen types of cacti and plenty of wildflowers, with a few uncommon species near the spring such as maurandella antirrhiniflora and clematis pitcheri. The route is relatively short, and easy, with just a few brief steep parts towards the end, so should be suitable even during the hot summer months. 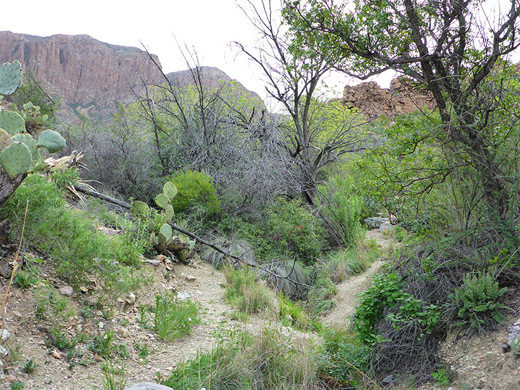 The Ward Spring trailhead is at a signed pullout on the east side of the highway, 5.5 miles south of Panther Junction Road, and there is space for about a dozen vehicles. 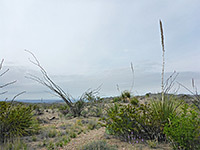 Looking east from the highway, the land is initially flat, becoming more uneven after about a mile, sloping up gently towards the Chisos Mountains which rise much more steeply in the middle distance. The path heads due east, soon reaching the shallow drainage of Cottonwood Creek, usually dry at this point, then staying close by on the south side. Vegetation is somewhat limited at first, though more abundant and varied as the route climbs a little, crossing small gravel mounds dotted with bushes, ocotillo and various cacti species - some of the more unusual are escobaria tuberculosa, glandulicactus uncinatus, mammillaria meiacantha and mammillaria lasiacantha. An old metal pipe runs beside the path in some places, once used to transport water to nearby Homer Wilson Ranch. 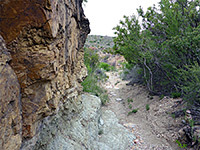 Approaching the spring, the land is a bit rockier, and the trail descends into a narrow side ravine, climbs the far side and drops down into the Cottonwood Creek streambed, which is partly enclosed by low cliffs. Just before the spring are some clear, shallow, grass-lined pools, then a short section of flowing water, emerging from a dense thicket of trees and bushes. The actual water source is hidden within the undergrowth. An unofficial continuation path climbs above the trees on the south side - the water can be heard trickling out-of-sight below - and crosses a thin volcanic dyke, one of at least three in this region, running north-south for several miles. 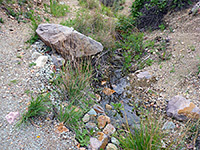 Past here, the trail descends to the dry streambed above the spring, and the upper section of the drainage (which contains a second spring) can be explored for another 2 miles until it ends at the foot of a low ridge, where a brief climb and descent links with the Blue Creek Canyon Trail to the south.